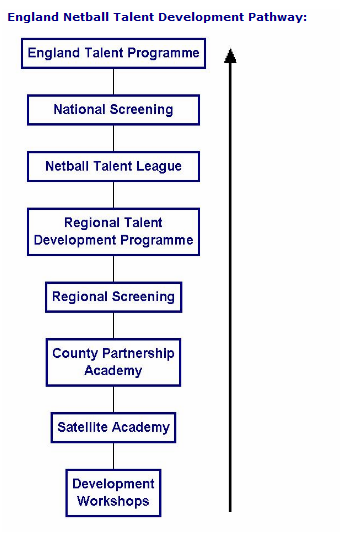 There have been many changes to the structure of Netball throughout England over the past couple of years. There are no longer County Representative teams at any age. Selection to trial for a place in the England Netball training squads follows a well-defined Player Pathway. This is player specific and has been designed to ensure that all players follow the recognised Long Term Athlete Development (LTAD) programme. 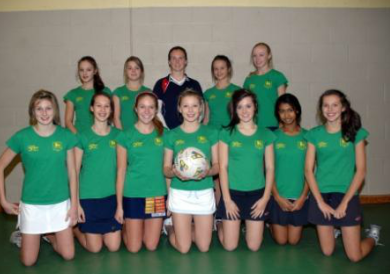 An extensive netball talent development pathway now exists for youngsters in Surrey & SW London. The pathway starts at school year 7 and runs through to year 12. Training is focused on individual athlete development. Some Satellite Academy members with England vice captain Karen Atkinson. Match play is now provided purely through club and school competition. A new competition struture has been introduced by England Netball to support this club focused approach. There are 'Club' competitions in each County with the winners representing Surrey in a London & South East league, leading to a National Final - with teams representing each Netball region. For further information please click here. Schools and clubs are allowed to nominate a maximum of THREE girls from school years 8 & 9 (or an exceptional year 7) to attend these sessions. Over the four weeks girls are assessed by the lead coaches (minimum Level 2) and the most talented individuals are nominated to Satellite Academy Trials. Five Satellite Academies are held across Surrey & SW London (Nonsuch 1, Nonsuch 2, Merton, Guildford, & Leatherhead). These offer ten, fortnightly, quality indoor training sessions where players receive top quality coaching, sports science and individualised fitness programmes. Click here for details of the 2012/2013 Surrey & SW London Satellite Academies. Twenty training sessions (Sep to March), trials in April / May each year. Schools and Clubs are allowed to nominate TWO netballers from school years 10 and 11 and ONE netballers from school years 12 and 13 to attend County Partnership Academy trials. Girls recieve twenty quality indoor training sessions where players receive top quality coaching, sports science and individualised fitness programmes. Top performers are then nominated to attend Regional Screening (July) for a place in the Regional Talent Development Programme. Click here for details of the 2012/2013 Surrey & SW London County Partnership Academy. For further details please contact Laura White, Netball Development Officer.